We Would Love For You To Vacation At Lorry’s & Meet You! Please Call 609-492-6363 While There Is Still Some Availability. At Lorry’s Island End Motel, The Memorial Day Weekend Is Busy as Memorial Weekend kicks off the Popular LBI vacation season, and we have our Annual Fun Free Customer Appreciation BBQ on Saturday of Memorial Day Weekend around 4:30 pm. You Save Money And Relax Longer by taking the 4 Day Memorial Weekend Discounted Rate by coming to Lorry’s Motel on either Thursday or Friday. at the beach – then you can leave either Monday afternoon/evening or Tuesday morning. The 4 day discounted rate makes the 4th day cost very little to relax a lot longer and you can check-in on Thursday or Friday afternoon or evening. 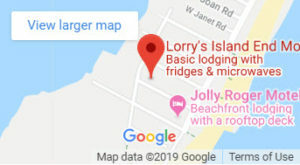 Lorry’s LBI Motel Staff Looks Forward To Helping You Have A Great Vacation on Beautiful Long Beach Island, NJ.